I’ve developed my own little way of doing facings that works really well for me, so I thought I’d share it. I haven’t seen it instructed anywhere else or included in a pattern, but for me it removes all the pain points of facings – the flapping out, re-wrangling into place after laundering, awkwardness of sewing them in the round to a neckline – and leaves a nice clean, smooth finish that doesn’t budge. 1. Draft the facing pieces. 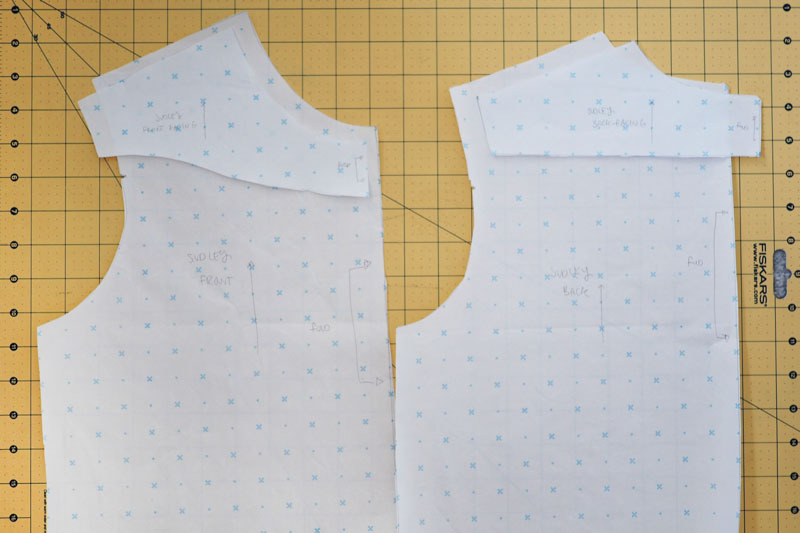 Basically you’re tracing off the neckline and shoulder area of the front and back bodices. 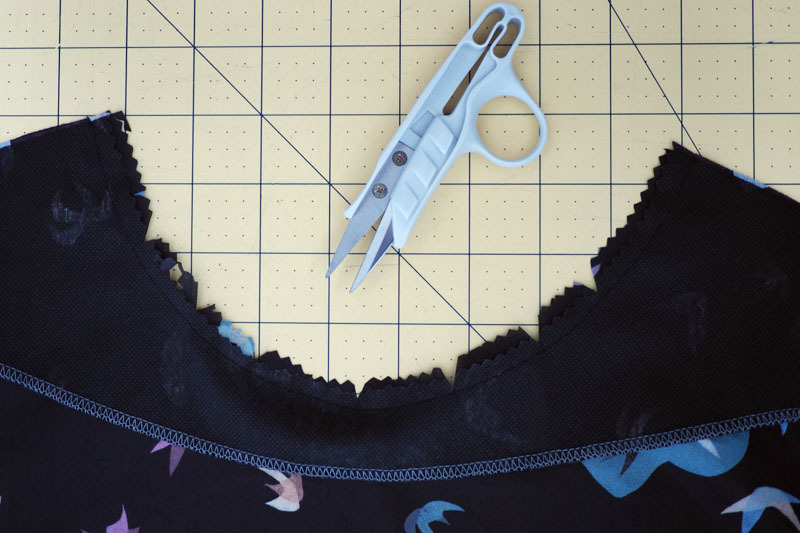 To get the depth, measure down about 2″ from the centre of each neckline. The back piece is cut straight across to the armsyce, and I’ve curved the front one gently up a bit as it reaches the armsyce. 2. 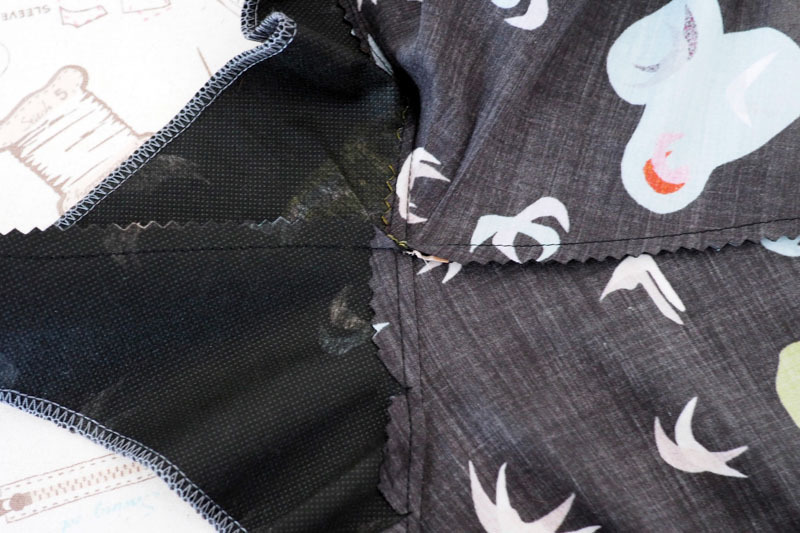 Cut out from the fashion fabric and from lightweight interfacing; fuse on the interfacing. Finish the lower raw edges of each piece, by pinking or overlocking. 3. The facings are sewn on individually before the shoulder seams are sewn. Pin and sew the front facing to the front neckline and the back to the back, right sides together, using the pattern’s given seam allowance. 4. Grade, clip/notch and understitch both the front and back as usual. 5. Now we sew the outer shoulder seam and facing shoulder seam as one. Right sides facing, pin front bodice to back bodice shoulder seam, and continue along the facing shoulder seam, taking care to line up the seam intersection in the centre. Sew at the pattern’s given seam allowance. 6. Trim (no need to finish the raw edge, I just like trimming with my pinks) and clip a triangle out at the seam intersection to reduce bulk. 7. 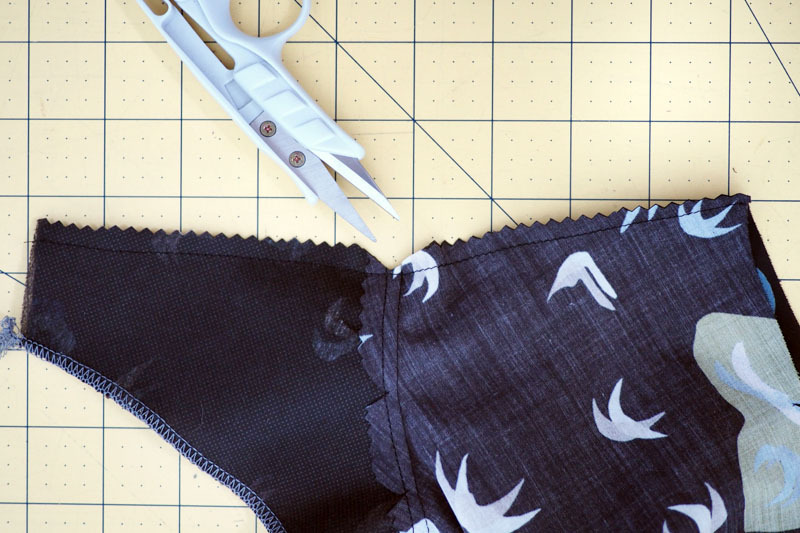 Press the seam allowances in opposing directions to help it lie flat. Repeat for other shoulder. 8. Fold facings to the inside and give a good press. Looking good! 9. 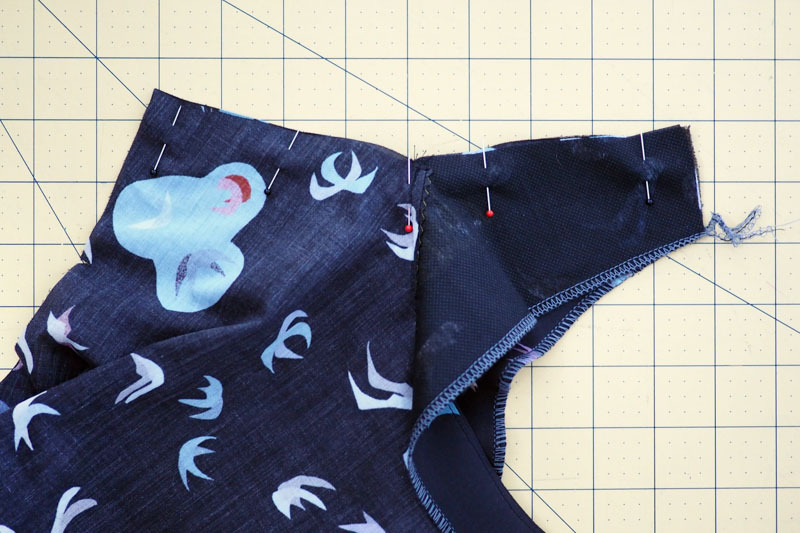 Finally, smooth out and pin the facings to the bodice and baste in place along the armsyce, inside the seam allowance. 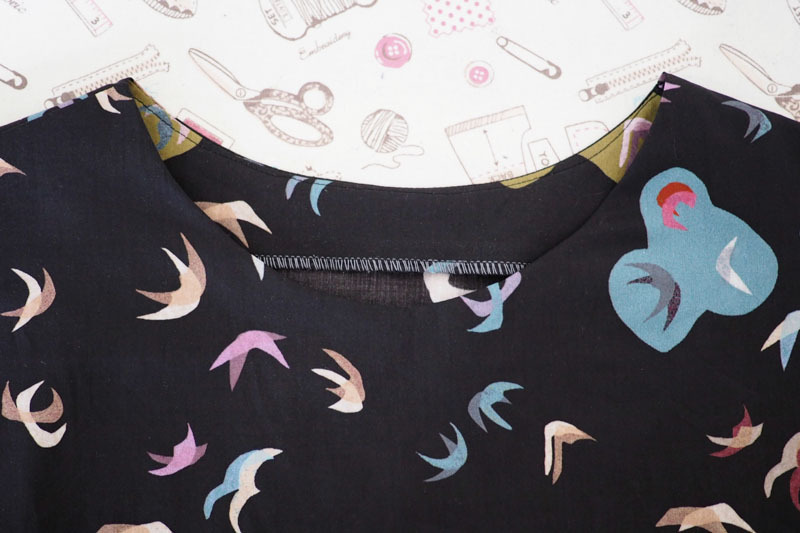 Now you simply treat the facing and main bodice as one when you sew in the sleeves. All done, a nice flat facing that will never flip out of place! I think it looks really smart and pretty inside and out. 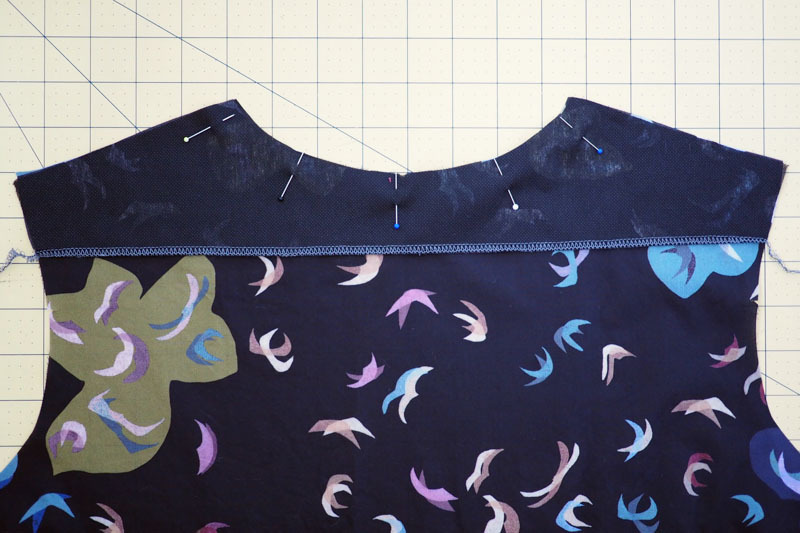 For invisible zips again sew the facings to necklines first (the back being in two pieces in this instance rather than on the fold), then insert the zip, then follow the other steps. What’s your favourite neckline finish? Any questions on this technique, just shout. Ooooh- this is fabulous! Can’t wait to try it! Thank you reminding me this good method for non flipping fabrics! 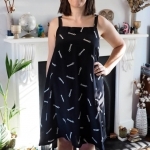 Deer and Doe has made and instructed the facings exactly like this for the Sureau Dress and it works so well to include the facings to the armhole seam. I have used it later when drafting a facing myself for the Aubépine and Emery dresses because I don’t line my cotton dresses. But then I didn’t remind it any longer but used the original flapping facings. I love your good explanations. Aha – I’m glad to hear it’s been seen in use somewhere, and that I could jog your memory! Great idea! Thanks so much for sharing it, Katie! Such a great idea! I’ve never seen facings done like this and will definitely give it a try! What a fabulous tutorial! I will definetely try this on my next project. Thank you! Love this idea, I’ll definitely give it a try. I love this method! Definitely will use this when making tops, dresses and tunics. This is brilliant! Thank you for sharing this. That’s a great idea! Thanks for such a clear tutorial – I’ll have to try this on my next facing! That’s so awesome! Thanks for sharing!!! Very clever indeed! Thank you for sharing! This is so clever and I’m not sure why it’s never occurred to me! I have taken to topstitching my facings down lately as I don’t mind the look but this is perfect for those times when topstitching is a no-no. I agree, topstitching can look lovely sometimes (generally on a solid or texture) but this does do the trick when you want a smooooth finish. Really great idea – I guess with a heavier outer fabric one could always make the facings out of something much lighter in weight. Great tutorial Katie! Indeed, that crossed my mind! Rightly or wrongly, I stitch neck facings down by stitching along the shoulder seams (in the groove of the seam) which always seems to work OK. I do the same along the side seams of skirts and trousers without a waistband to stop the facing flipping up. My mum taught me to do it this way so it’s a totally legit method….! It is – I do that too and it definitely helps. This one is pretty similar really, you’re just anchoring in the armsyce instead of along the shoulder line. Brilliant!! This should be used in patterns. Pattern companies….take note!!! Thanks for sharing!! Hah, I don’t usually follow the given instructions. It’s quite surprising how difficult they make things sometimes. Once you have your own techniques down it’s a lot easier! Good to know it’s mum-approved! Great idea, thanks for sharing! I usually finish necklines with bias binding as I’ve not got on too well with facings in the past, but I think this will change that! I used to be a bias die-hard too but now this one usually wins for me! Wonderful tutorial that simplifies neckline facings. I’m going to bookmark your instructions for future use. Thanks for sharing! Awesome! Thanks for letting me know it was helpful! Thanks! I generally hate facings because of the flip and often do a bias binding instead. I’ll try this. Brilliant! Thank you for sharing this tip! 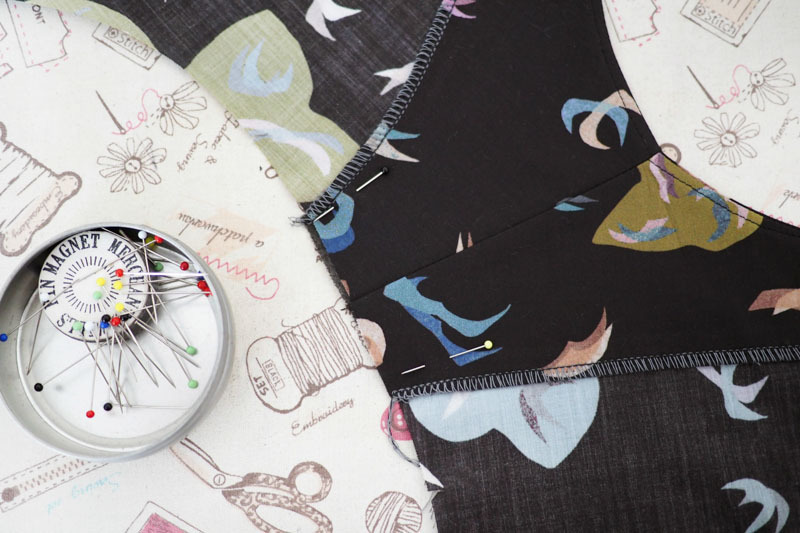 I am sewing for many years, never see this before, it is a fantastic idea, that I will be using from now on. thanks. This reminded me of the all-in-one neckline and armhole facings for sleeveless tops I made back in the day. Never thought of doing this with sleeves. Great idea. What a great idea — and tutorial!! I’ve also done facings this way. I works wonderfully. Flipping ‘eck! Love this simple solution! Thank you! ? Ok this is a definite must try! I always end up doing bindings whenever facings are required because I just can’t stand them flipping out. This is genious! Thanks so so so much for the tutorial! Aha! Thanks for this! Papercut’s Skipper is done like this – the square neck version – I loved it, resolved to use it in the future, and promptly forgot! The only problem with mine is that I made it in linen and it gets very tricky to iron , since I don’t like to iron linen on the right side….. Genius!! I’m a big fan of facings, and this makes them even better! This is great! Thank you so much for the tutorial, I’ll definitely try this method next time I’m sewing a facing. Also, where did you get that fabric of the girls with their hands over their eyes? It’s so cool!! It’s from Ditto Fabrics, but sold out I’m afraid! Great tutorial, thank you. 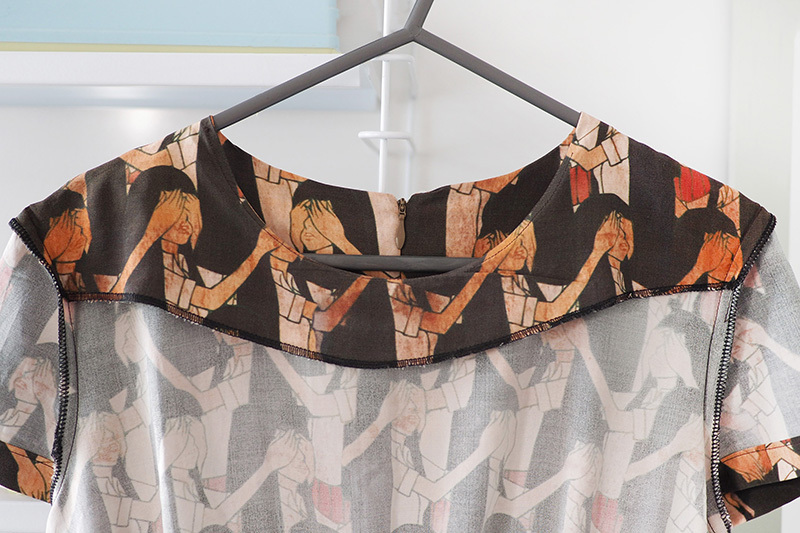 Would it work to have the facing include arm holes for sleeveless dresses (I hope that makes sense). 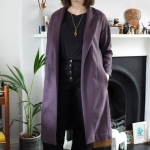 Yes, in that case I would use the all-in-one technique, which produces a similar result but the sewing order is different so you can turn it right sides out again! If you google ‘all in one facing’ you’ll find some tutorials. Thank you for that great tutorial! I will definitly try that. 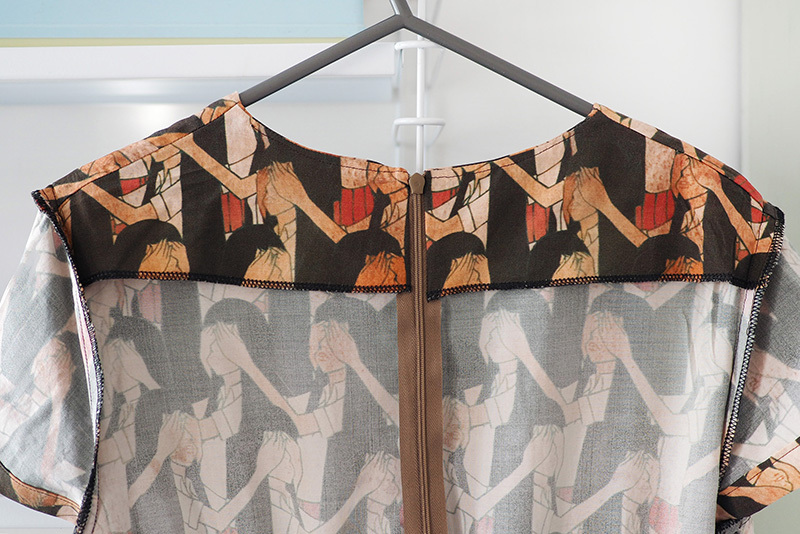 Have you tried something similar with kimono style or raglan sleeves? 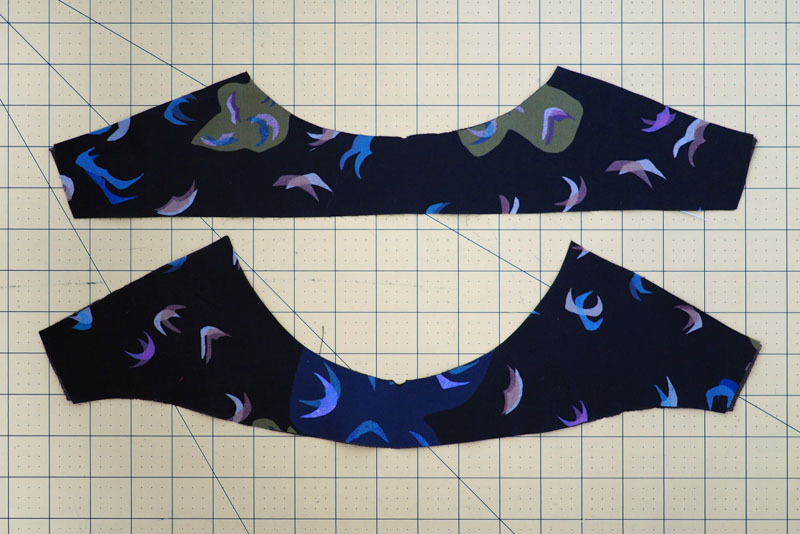 I don’t think it would work for kimono or raglan sleeves, because you need the armsyce to anchor the edges in to. 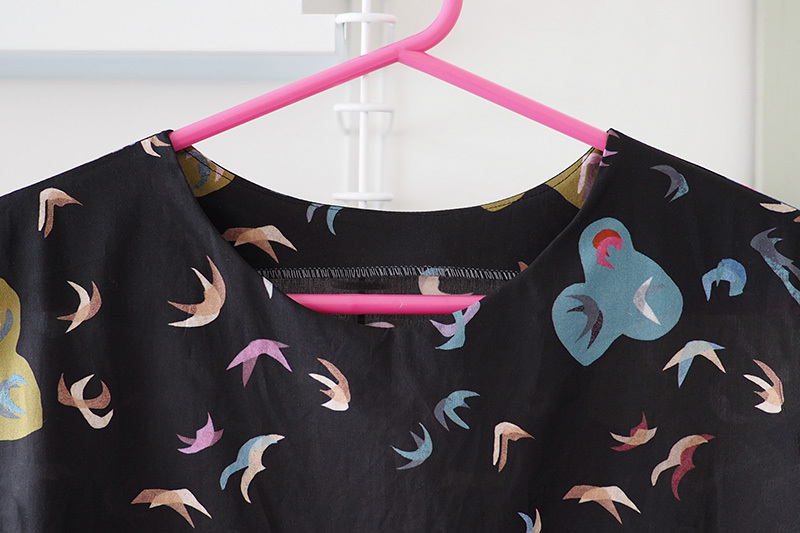 PS Love your dress fabrics – so cute! What a fantastic idea! I’m definitely going to try it! Brilliant Ida. Thanks so much for sharing. I agree that is method is genius! I will definitely try it! I have a question, though. It appears that you have under stitched the facing as well. Is this the case? That step is not mentioned in the tutorial, but it looks as though there is a line of stitching on the inside of the facing. So glad I read this! I’ve only really been sewing for about a year, and some things have just not improved the way I’d hoped they would (especially my neck facings). I decided to do this on my own for a Whitney Deal Ryan top I made a couple of weeks ago, and it made things so much easier. Glad to know it’s ok to “break” the rules where this is concerned! Oh definitely – I have a bank of preferred techniques now so I don’t often follow the instructions! THIS IS SORCERY! I hate facings. Hatehatehate them! So much so, that I often refuse to do them, and I have the il-fitting garments to prove it. But this bit of magic might have just saved my sewing. Thank you, Katie! Yay! Down with crappy flappy facings! Thanks Katie, this is great! I love the clean look of facings but never use them because of their tendency to flip out. Thanks for sharing this. Thanks for sharing. 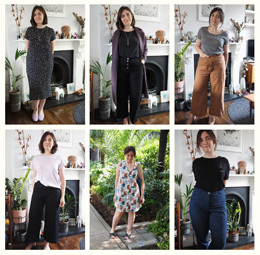 I experienced the floppy facing neckline for the first time recently and it seemed to be linked to a shallow curves neckline (more boatneck). Pinned so I can try this technique next time. This would work very well on a boat or slash neck, I reckon. I did this exact method on my niece’s wedding dress (medieval with long sleeves) because it was long distance, and she has small shoulders. This meant that the shoulders could be adjusted locally if need be, without dismantling the top of the dress. Thanks so much for sharing this tutorial! I’ve been avoiding patterns with facings like the plague because they always flip or move in some kind of way, grr! 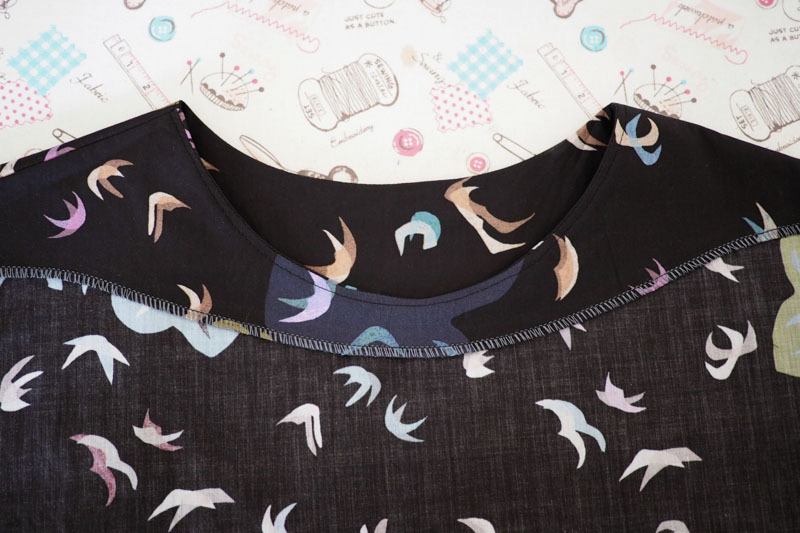 I’ve been following a pattern instructions to sew the facings together first, then put them on the neckline. However, for some reason, the neckline and facings are not equal. I think the neckline stretched (even though I stay-stitched it). I suspected that instead, I should try to sew the facings to the neckline first, so I searched the internet and found your blog. I can’t wait to try it! You are right, another benefit of this approach would be less handling and stretching of the pieces so it should be easier to get them to fit. Hope it worked for you! I stumbled upon your tutorial – and immediately had to try it. It worked out great. It is so much easier and most important: the fit is perfect. The annoying thing about neckline facing for me always was, that I had to do it quite at the end – the last thing that remained to be finished. And so often it did’t turn out the way I hoped it to be. I found that very frustrating. 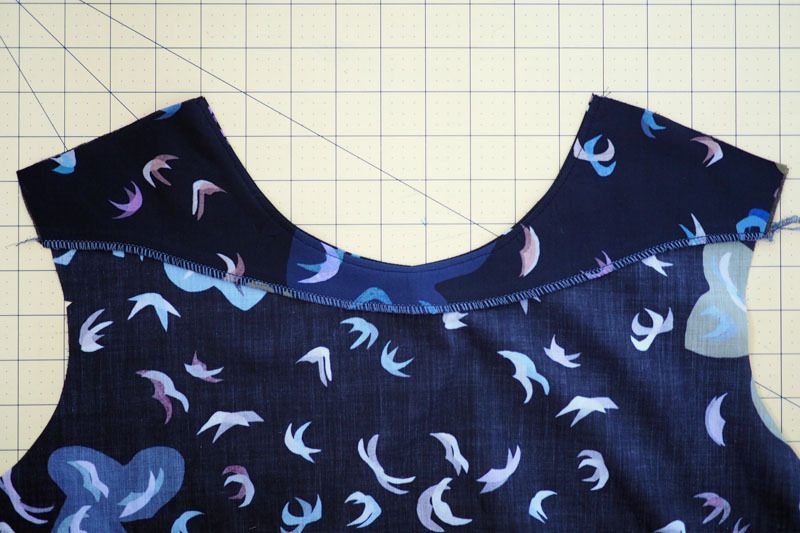 With your method the neckline is the first thing to sew. Now I know quite quickly if it fits and looks like expected. And no flipping… Thank you very much for sharing this!! Glad it worked well for you, thanks for letting me know!